Doctors Urge Patience, And Longer Labor, To Reduce C-Sections : Shots - Health News For many women, a safe, healthy labor lasts longer than the times cited as normal, according to guidelines from the nation's obstetricians. Giving women more time ups the odds of a vaginal delivery. Women with low-risk pregnancies should be allowed to spend more time in labor, to reduce the risk of having an unnecessary C-section, the nation's obstetricians say. 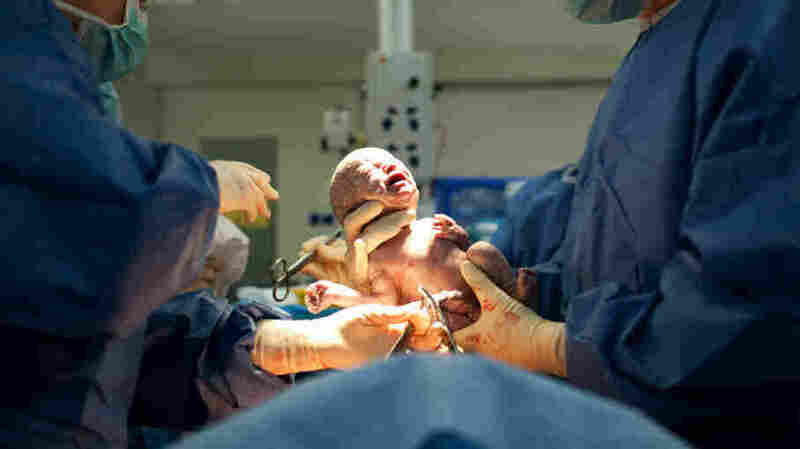 The new guidelines on reducing cesarean deliveries are aimed at first-time mothers, according to the American College of Obstetricians and the Society for Maternal-Fetal Medicine, which released the guidelines Wednesday online and in Obstetrics and Gynecology. About one-third of all births in the U.S. are done by C-section, and most of those are in first-time mothers. There's been a 60 percent increase in these deliveries since the 1990s, but childbirth hasn't become markedly safer for babies or mothers. That discrepancy has led many to conclude that the operation is being overused. A C-section is major surgery. The procedure can increase complications for the mother and raise the risk during future pregnancies. Women giving birth for the first time should be allowed to push for at least three hours, the guidelines say. And if epidural anesthesia is used, they can push even longer. Techniques such as forceps are also recommended to help with vaginal delivery. Early labor should also be given more time, the doctors say, with the start of active labor redefined to cervical dilation of 6 centimeters, rather than 4. For many women and their doctors those are big changes. So we talked with Dr. Aaron Caughey, the chief of obstetrics and gynecology at Oregon Health Sciences University in Portland and lead author of the guidelines, to find out why. The highlights from the conversation have been edited for length and clarity. It seems that a key point of the new guidelines is that doctors and patients shouldn't rely too slavishly on fetal heart rate monitors when trying to figure out if the baby's in distress. Is that right? The tool itself does what it does, it tells you what the baby's heart rate is. But there's a problem on the interpretation side of things, trying to determine what the changes of the fetal heart rate really mean. We really don't understand the tool all that well. The incidence of a child being injured in the womb is pretty low, probably about 1 percent in a normal pregnancy. In 100,000 women you're going to have 1,000 problems. If you miss one that's really bad, that's an injured baby, that's an upset family. It really impacts the doctors and the nurses, and, of course, it's costly to the hospital. We don't want to miss things. But if we're trading off hundreds of C-sections to prevent one injury, the question is what that trade-off should be. At some point that number is too high. The harm on the moms is too high, and on future pregnancies, too. A lot of women are probably groaning at the thought that labor should go on even longer. What's the basis for this? This has been questioned for as long as a couple of decades. But over the past five years, a number of papers have been published showing that labor indeed takes longer than we thought, on average. But more importantly, it takes longer for some of the extremes. There's a much wider range than we thought. Everyone likes to think of the bell-shaped curve, and you start thinking, this is going on longer than average. But it's not actually a normal distribution; there's a long tail to the right — a lot of women have a labor that's much longer than average. In early labor, when they're not changing their cervix much, we think that this can go only for many more hours than we previously thought. In the active phase of labor, we don't think that should last for days, but it can take more than the three to four hours that we thought. So can women and their doctors relax a bit, and not get scared if they go over the average time? Yes. The single most common question I'm asked on the labor floor is, "When's the baby, Doc?" I commonly respond not with a time but with a date. If it's early in the morning, 3 or 4 in the morning, I'll say, "Yeah, I think the baby is coming today." That usually elicits a laugh. But I give myself a 20-hour leeway. I don't want them to be too worried, to think that it's dangerous that this has gone on too long. Is that different from what you learned in medical school? My practice really changed when I came to San Francisco in 1999. I was initially horrified by how long the physicians and the midwives allowed women to labor. I came from an environment where we had benchmarks, and we followed them. Then we started looking at the second phase of labor, just when you're pushing. We found, lo and behold, that women who pushed longer than three hours, longer than four hours, even five hours, the babies didn't have worse outcomes than the babies delivered in the second hour. And they did better than babies delivered in the first hour. How can it be that we're just now finding out what's a normal length of labor? You know, before 1955 there was essentially no quantitative data on the length of labor. Then Emanuel Friedman said we should study this. He studied 500 women, and, of those, he said here are the 200 women who have idealized labors. We then managed 4 million a women a year for the next 50 years based on 200 women. It's not that the wrong approach was taken; it's that we started science and then didn't continue to do the science. How is science done? A lot of it is driven by economic demand. There's no money in being patient in labor. I don't think they're going to come up with a special stopwatch. Because of that, nobody has really pushed to look at this again. I think in some communities there has been a progression toward this practice in the past 10, 15 years. But in other communities it could be a dramatic change. It varies a lot around the country.